Perugia, Italy, 3 October 2013. You may still remember what I think about having data-converter conferences in Italy – it’s a fantastic idea. The food, the beautiful landscape, historic buildings and nice weather made me fall head over heels in love with the country. So check the conference site out to see if it’s something for you. I’m completely in love with Italy now. It was my first time there, and I was impressed by just about every aspect of the visit – the beautiful landscape, the fascinating history embodied in ancient buildings, and of course by the people. Perhaps it was accentuated by me going through the “vanilla phase” with Italy, but it did seem very easy to get a kind smile from just about any Italian I met throughout the entire trip. 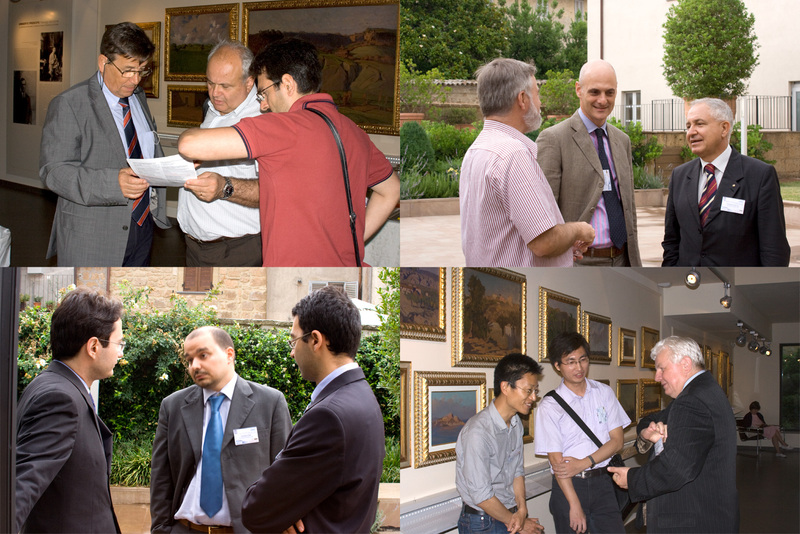 Attending IWADC 2011 was every bit as pleasant: The conference itself ran like clockwork, the medieval city of Orvieto was a decidedly pretty conference location, and the relatively small size of the conference contributed to the relaxed and friendly character of the event. Almost like a family event – a big happy Italian family, I could imagine :-). The feeling of being welcome and surrounded by “family” was very much accentuated by the hospitality shown by the conference general chair, professor Paolo Carbone (University of Perugia), members of the organizing committee, and other delegates. During the conference dinner when we were also treated with one tasty Italian dish after another, I remember uttering something like “all conferences should be in Italy”. That’s how good it felt to be there. Now being a solid tradition, each conference I attend needs to have an opportunity to connect with Converter Passion. To motivate conference delegates to not be shy we came up with the Connect with Converter Passion (CWCP) prize. The rules are simple: First blog reader to find me at the conference and claim the prize is the winner, and for IWADC 2011 the winner is Yu Lin, a PhD student at Technical University of Eindhoven who was also presenting the paper “An Input Signal Statistics Aware Design Approach and Examples for Analog-to-Digital Converters for communication systems” at the conference [co-authors: Kostas Doris (NXP), Hans Hegt and Arthur van Roermund (TU Eindhoven)]. It was a pleasure to meet such a motivated blog reader. 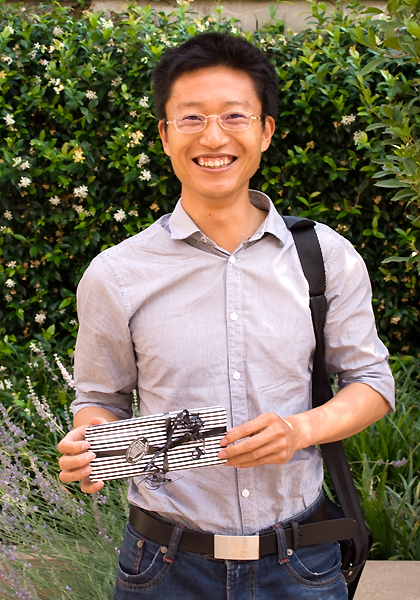 Yu aimed for victory and did not hesitate to claim the prize already at the informal pre-conference reception at restaurant Maurizio. Definitely the right spirit and a worthy winner indeed. Congratulations! Normally, the competition is only for the glory, but this time a small surprise memento was added in the form of a handmade key ring in black leather produced by “Boothill Bob” from Boothill Bob Holsters. IWADC covers ADC modeling, testing and data converter analysis and design. Because it is an IMEKO conference, various aspects of measurement becomes a natural thread in many contributions, although the scope is rather wide. It includes calibration of ADCs and error correction of the ADC output, such as presented in the papers “Digital background calibration of subsampling time-interleaved ADCs” by Centurelli from Università di Roma la Sapienza, and “A Linearization Strategy for Undersampling Analog-to-Digital Converters” by Vallant from Cassidian Electronics. Time-to-Digital Converters (TDC) seems to be a growing field, and a fair number of papers addressed various aspects of TDCs, for example “Modeling Noise Effects in Time-to-Digital Converters” by Napolitano, University of Perugia, and “Time-to-Digital Converter (TDC) with Sub-ps-Level Resolution using Current DAC and Digitally Controllable Load Capacitor ” by Alahdab from University of Oulu. There were classic ADC implementation papers such as “A 6-bit 3GS/s Flash ADC in Bipolar 0.25 um for the radiotelescope SKA” by Da Silva from Station de Radioastronomie de Nançay, and I personally found it interesting to hear about ADC implementations in emerging materials, as in “ADC Design in Organic Thin-Film Electronics Technology on Plastic Foil” by Marien of K. U. Leuven. Of my own contributions, the first (An empirical approach to finding energy efficient ADC architectures) was about using the measured performance of chips made by others to better optimize your own design, and the second (Using Figures-of-Merit to Evaluate Measured A/D-Converter Performance) treated how to assess the quality of figures-of-merit often used to make comparisons of measured performance. There were many more papers presented at the conference, but I don’t intend to walk you through the entire program. Note also that I have mostly mentioned the first authors above although most papers have one or more co-authors. Please add comments below and tell us about any papers, co-authors or delegates that you wish to mention. Or just say hi, and let everybody know you were there too. Share the name of your contribution, and your impressions from the conference with us. Yes, I was there. 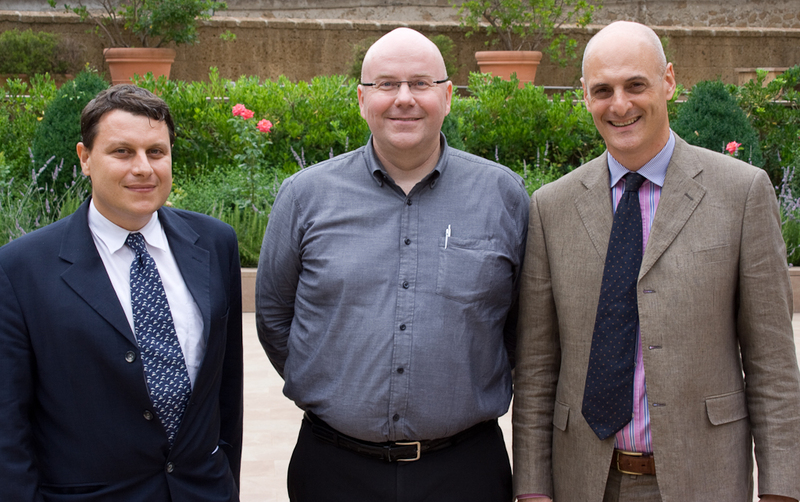 Here together with publication chair, Dr. Antonio Moschitta (left) and general chair, professor Paolo Carbone (right). 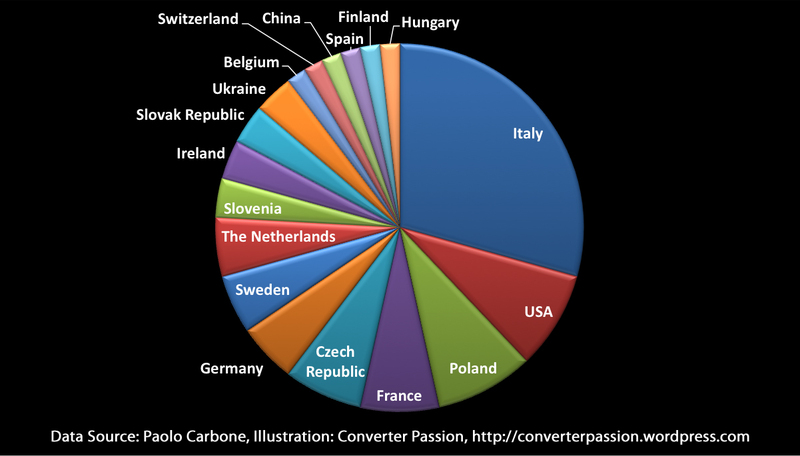 To round it off, I’ve made a pie chart of the distribution of delegates between countries, based on statistics provided by professor Carbone. 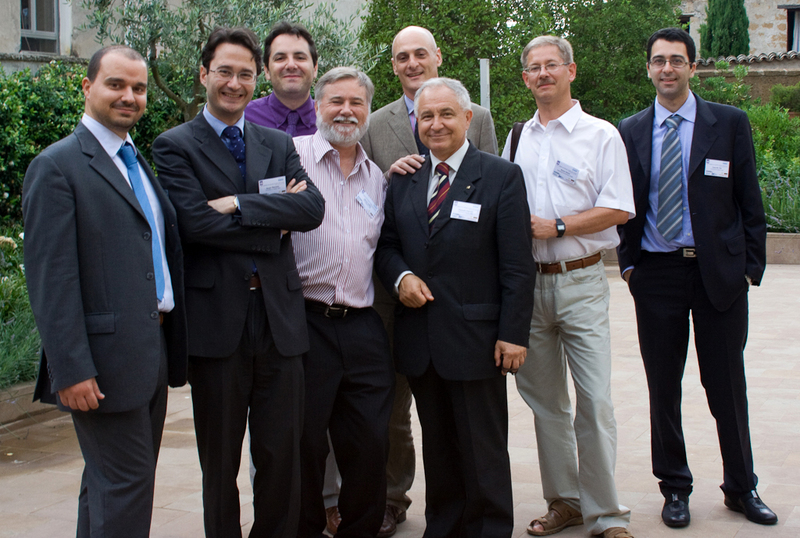 As could be expected, the Italian representation was strong. The rest of the countries are quite evenly represented. As you can see, delegates came from both USA and China, although the vast majority were from European countries. Please post your comments below if there is anything you’d like to add about the conference. I recently rediscovered an old friend of mine – the IMEKO International Workshop on ADC, and I though it might be of interest to my blog readers to hear about this conference. It is purely data-converter oriented, so it certainly fits the profile for many of you. The official name I believe is 2011 IMEKO IWADC & IEEE 2011 ADC Forum, where IWADC stands for International Workshop on ADC Modeling, Testing and Data Converter Analysis and Design. It certainly sounds like my cup of tea. Well, … I’ve been aware of this conference for many years. Also, when scanning for source data to include in my large ADC performance survey, previous contributions to this conference would regularly show up on my radar because of their ADC relevance. What I mean is that I haven’t been to this conference for a long time now, but hopefully 2011 will be the year to correct that. IWADC covers a broad range of data-converter topics – from design to modeling, measurement and error-correction. Check out the official call for papers for more information. In the event that I will actually contribute something, you are sure to hear about it right here on blog. 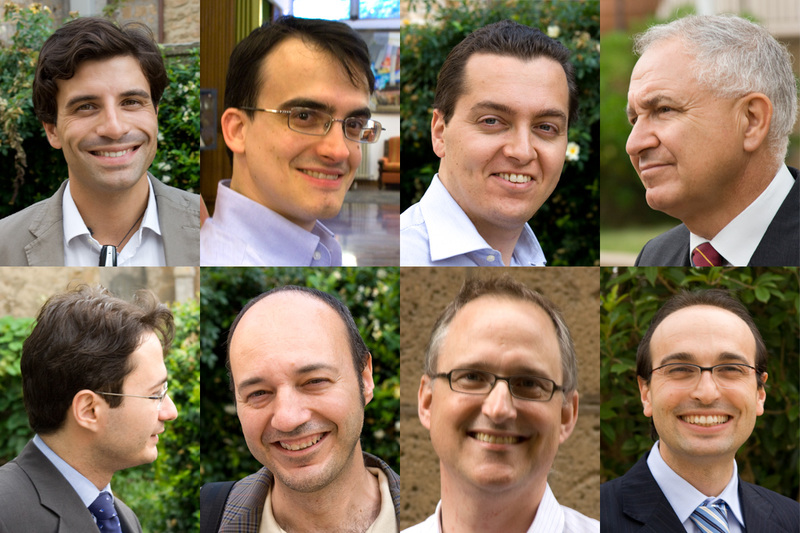 In the meantime, just take a look at the venue and imagine yourself in the medieval town of Orvieto, Italy, 30 June to 1 July next summer … surrounded by like-minded data-converter enthusiasts and the various treasures of the Italian region of Umbria. 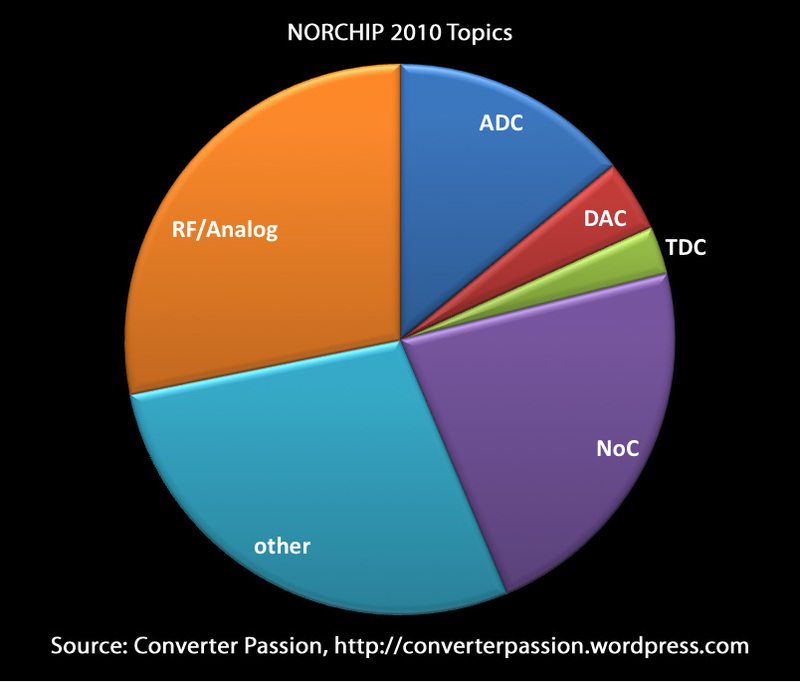 Approximate distribution of topics among NORCHIP 2010 conference contributions. Taking a quick look at the NORCHIP 2010 conference program it appears that ADC & DAC papers make up around 18% of the population – 21% if you add the two TDC (time-to-digital) contributions. That’s got to be good enough: It means that more than every 5th contribution is directly relevant to me. Couldn’t really ask for more at a conference with such a broad scope. RF/Analog papers make up around 28% of the contributions, and that’s a more relevant topic for me than NoC. The pie chart shows the approximate distribution over different topics. The “other” slice represents presentations on 3D integrated circuits and mostly digital stuff. I don’t know if it was a goal, but as you can see the organizing committee did an excellent job in dividing the space almost perfectly into 50% RF/analog + mixed, and 50% digital + 3D-IC. The total number of contributions is 71, distributed over 40 oral presentations (4 invited) and 31 posters. One that I’m curious about is the invited talk “Mixed-Signal versus Purely-Digital Self-Calibration of High-Resolution Pipeline A/D Converters” by professor João Goes from Universidade Nova de Lisboa, Portugal. Having worked quite a lot with ADC calibration myself (e.g., this patent), his talk is exactly my cup of tea, and it will be very interesting to hear his findings. Finally, don’t forget to say hello, if you are attending the conference … With a bit of luck, you may find yourself and your work featured in a future blog post.